Cable crunches are safe and effective, making them a mainstay exercise at the gym. The advantage of using cables is that they are constantly providing tension because they can pull in different directions that free weights, which can only pull down. Cables also allow you to add weight safely to your exercise. Because the cable is fixed along a certain path, it is less predictable than a free weight. If you don't have access to a cable machine, however, you can still reap the benefits of the cable crunch by using a pair of dumbbells. With proper form, you can recreate the constant resistance on your abs that a cable machine provides for an equally challenging ab workout. Lie on your back on a bench and a dumbbell in each hand. Use a raised surface, like a bench, because your arms will need to go lower than the rest of your body. Raise your legs up, with your knees bent, so that your thighs are perpendicular to the ground and your knees are bent at a 90-degree angle. Reach your arms over your head so that your biceps are next to your ears. Allow your elbows to bend slightly so that the dumbbell is below the bench. Perform a crunch from this position, curling your head, shoulders, and neck off of the bench and rolling up towards your knees. Curl up until your head and upper back are off of the bench. As you curl up, keep your arms in the same overhead position as step three. They should move in sync with your head, neck and body during this exercise. Read More: Why Do High Repetitions Cause Muscle Definition? Start with at least ten repetitions to ensure that you are getting enough repetitions to learn the movement. Two to three sets is enough, especially if you are new to this exercise. A comprehensive study from the Journal of Strength and Conditioning revealed that performing two to three sets of an exercise is much better than one set, but around the same as performing four to six sets. In other words, two to three sets will provide a lot of benefit but doing more than that won't provide much more benefit. Stick to two to three sets and if your results start to slow down gradually add one set at a time. Aim for a weight that you can do three sets of 10 repetitions with. There is nothing particularly special about that number; it simply means that you are using enough weight for the exercise to be challenging but the weight is light enough that you can concentrate on form. 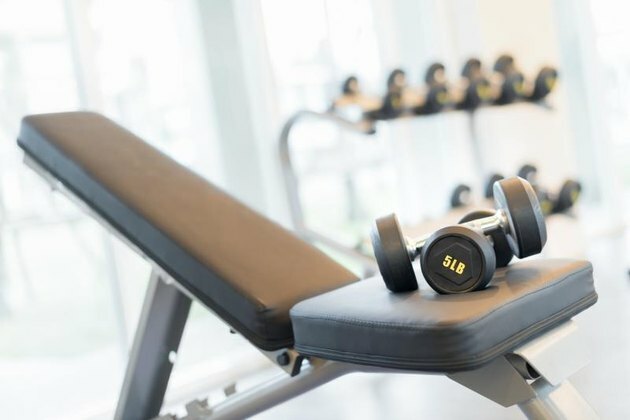 Over time, you can decrease the weight if you want to do more sets and repetitions or increase the weight to make the exercise more challenging. During this exercise, your shoulders will be in a very extended position while you are holding weight. When your shoulders are extended it makes them more vulnerable to injury, according to the orthopedic research institute of the University of New South Whales. Therefore, if you have a shoulder injury, use lighter weight or no weight at all. Crunches can also be harmful to your lower back, so if you have lower back problems you may want to avoid this exercise. Dose-response of 1, 3, and 5 sets of resistance exercise on strength, local muscular endurance, and hypertrophy. Strength outcomes in fixed versus free-form resistance equipment. Single versus multiple sets of resistance exercise: a meta-regression.